Explore our Costa Rica surf holiday destinations. Columbus landed in Costa Rica in 1502 and began to colonies the land for the Spanish. Previous to this the natives where a mix of different cultures and the region was not densely populated. This lack of available bodies to work the land for the Spanish, along with a lack of any gold or silver meant the country was largely overlooked by Spain and left to develop on its own. Full independence came in 1838. It is often described as the happiest country in the world and has won the Global Well-Being Index on numerous occasions. Surfing in Costa Rica was slow to develop. In the 1960's surf towns like Tamarindo were small villages with no running water & electricity. Rainy season would often wash out the road to the town so access was very difficult. In the mid 70's, seeing the potential as a tourist destination, locals began to petition for access roads to be built. The locals set up hotels but mostly for American tourists looking to escape the winter and not for surfers. In the 60's and 70's American surfers tended to drive down from California to surf in Mexico and the rest of Central America however they often didn't get as far as Costa Rica. Word was that the beaches were inaccessible and the waves not all that good. It wasn't until the late 80's that travelling surfers started to arrive in numbers. The Caribbean side took off first as it was easiest to get to, then locals began surfing in Jaco and areas close to the Pacific side of San José. Surfing Costa Rica has the advantage of two coastlines that both receive consistent swell so it was never going to be long before surfing become popular developed. In 1999 the Costa Rica Surf Association was founded. This paved the way for a more organised approach, local competitions and surfing is now thriving. In 2015 Costa Rica were crowned the ISA World Champions. What's the surf like in Costa Rica? Costa Rica surfing holidays tick just about every box - long stretches of sandy beaches, year round sunshine, warm water, friendly people, great buzz and a real sense of adventure. Whether it’s a family surf holiday, off the beaten path surf mission or a surf & beach holiday, Costa Rica can serve it up, and more. Costa Rica surf holidays are generally best for beginner to intermediate surfers. There are great waves for advanced but not as many epic big wave monsters! The country benefits from having surf on two coastlines, the Pacific and the Caribbean, and it takes 5 hours to get to one from the other so its possible to surf both in one day. The north is famous for its beautiful white beaches. The very north west part of Costa Rica as it reaches the border with Nicaragua is covered by the massive Santa Rosa National Park and home to two of Costa Rica's most notorious surf spots Witches Rock And Ollie's Point. Both spots are for more advanced surfers and are real missions to get to. The best way to reach them is by boat but those who go will be rewarded. The main surf base for this area is Tamarindo. It has become one of Costa Rica's most popular surf towns with some of the best Costa Rica surfing holiday options. The long beautiful beach at its centre is great for learning how to surf and their are more intermediate & advanced breaks close by. Tamarindo is full of surf bars, cafés & restaurants and a host of excellent Costa Rica surf camps. Aside from surfing there are plenty of other activities and trekking nearby. The town is spread out enough that it easily suits a family as well as those looking for a lively nightlife type surfing holiday in Costa Rica. It's a 5 hour drive from the capital San Jose airport and an hour from Liberia international airport. Head south for 30 minutes and you will reach Avellana & Playa Negra, crystal clear water, highly consistent surf with different breaks for all levels. Nosara is the next town south and is a smaller version of Tamarindo. Although it is growing it still maintains a surfers paradise air to it, mixing Costa Rica surf resorts with laid back surf camps. The area is surrounded by 3 stunning beaches with some of the best surf for beginner/intermediates in Costa Rica. 25km's south of Nosara, 50 minutes by car, is the beach town of Samara, a beautiful scenic area with one of the most beautiful beaches in Costa Rica. The town is a great base to experience a true authentic Costa Rican beach town, with a great choice of restaurants and beach bars with no over tourism. There are good surf beaches 15 minutes north and south to explore, the towns beach itself is good for learning for the first time but would not be a classic learn to surf beach or a place for intermediates or advanced. The adjoining villages of Santa Teresa & Mal Pais make up the next area south. Santa Teresa is one of Costa Rica's nicest surf towns, not overdeveloped, a small laid back village with a few late night spots but not an all night party vibe. It is also a popular Yoga destination. The roads here are not fully paved but they are easy to drive on. There are very consistent right and left beach breaks in the area, perfect for learning and intermediates. 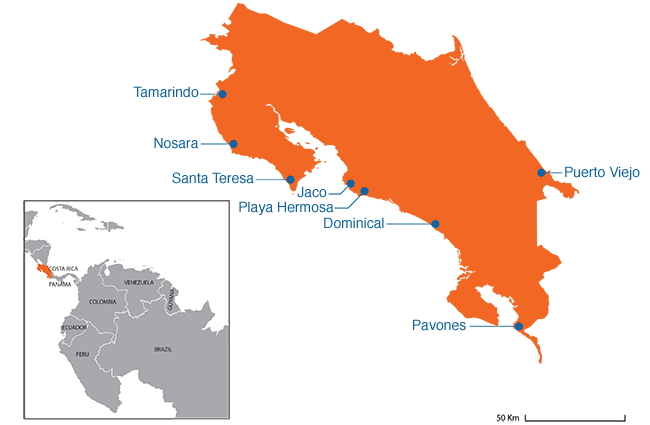 Jaco lies at the north part of the central Pacific area and is the most developed surf town in Costa Rica. It is only a 1 hour & 30 minutes drive from the capital San Jose and due to its proximity has become a modern tourist area full of bars, restaurants, lively nightlife, golf courses and a mix of inexpensive to luxury accommodation. It is surrounded by some of the best surf in the country, including the main 3km beach break in town, and Playa Hermosa & Esterlillos further south. For the more advanced there's Playa Escondida, Roca Loca and an hour north is one of the longest lefts in the world Boca Barranca. Dominical is one of Costa Rica's gem's, a true laid back surf town, where shorts/bikini and a surfboard is all you will ever need. The coastline around Dominical is dotted with chilled out towns, with a mix of different Costa Rica surf camps options to allow you stay & surf the area. There are no big tourist shops or restaurant chains so you can escape modern living for a while here. The main surf beach in Dominical is a very consistent barreling wave and next to it is a protected bay for beginners. The South West corner of Costa Rica is home to the country's most famous wave 'Pavones'. It is estimated to be the longest left in the world and can be ridden for over 1km. The main beach has good beginner & intermediate take off spots also. The area is one of the few places left where you can walk through rainforest and all of a sudden arrive at an amazing surf beach with no one for miles. Pavones town is the least developed surf area in Costa Rica. Its remoteness means it is a surf holiday here is very laid back, with everyone hanging out in the same chill out bars in the evenings watching the sunset and talking about the surf. It remains one of the last off the beaten path surf destinations. The Caribbean coastline is short with the majority of activity south of Limon, 2-3 hour drive from San Jose airport. It's a busy port city rather than a tourist town. There are some good breaks in and around the city but most people head an hour south to Puerto Viejo. The 70km stretch of coastline here is full of countless beach breaks of good quality although they max out at around 4foot. If your looking for a laid back surf and reggae Caribbean vibe then Puerto Vielho is the spot. Playa Cocles & El Barco are great beginner beaches, while Salsa Brava is a reefbreak that can produce epic right handers. The Costa Ricans don't know what a wetsuit is! Both the Pacific and Caribbean side have average water temperatures of 28°C so all you need is shorts and bikini's. A great time to go is always the shoulder months, less tourists, accommodation is less expensive and best of all the waves are not crowded. Pacific Side: Air temperature is the same year round: 32°C in the North and a slightly cooler 28°C in the South. Dry Season: December to April. This is generally the busiest time for tourism and Costa Rica call it summer. Wet Season: May to November. Costa Rican's call this Green Season. Expect sunny mornings and tropical showers in the afternoon. The rain pattern is almost like clockwork so its easy to plan around. Dry Season: February- April, September & October. Dec to March and July to August are the most consistent in the Caribbean producing 2-10 foot waves, however it is a year round destination so the shoulder months have great surf too. 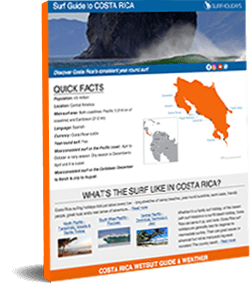 For a more detailed look at when & where to surf in Costa Rica for your surf level use our Surf Trip Finder. Then browse each destination to discover the great choice of accommodation & lessons in CR's best surf towns. Book your surf holiday online today!